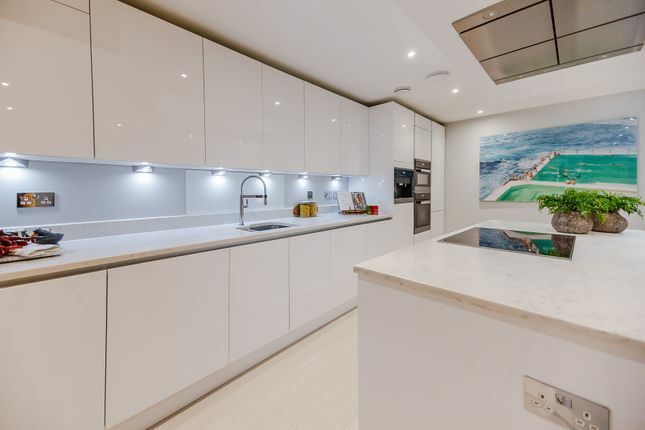 On offer is over 1200 sq/ft of luxury living including two bedrooms both with en suite bathrooms, a double reception room opening onto a small private space and a show stopping basement consisting of kitchen/diner and all-round entertaining space complete with WC. The fully fitted Metris Kitchen is complete with Miele appliances including an integrated dishwasher, washer/dryer, full height fridge freezer, oven, hob and integrated extractor fan as well as a Caple wine cooler. The bathrooms comprise of full bathroom suites with underfloor heating whilst the bedrooms boast bespoke mirrored wardrobes and automatic lights which are sure to impress. Further benefits of the apartment include a Crestron audio visual system, a digital video door entry system and pre-wiring for Sky + TV. Residential Land is the owner and managing agent of this property. Rent directly from us and pay no agency fees - just a one-off checkout charge. All our tenants benefit from a dedicated building manager who is on hand to assist with any property related issues. We also employ a dedicated team of maintenance experts and provide a 24-hour emergency helpline. Property descriptions and related information displayed on this page, with the exclusion of Running Costs data, are marketing materials provided by Approved Property Services LTD, and do not constitute property particulars. Please contact Approved Property Services LTD for full details and further information. The Running Costs data displayed on this page are provided by PrimeLocation to give an indication of potential running costs based on various data sources. PrimeLocation does not warrant or accept any responsibility for the accuracy or completeness of the property descriptions, related information or Running Costs data provided here.